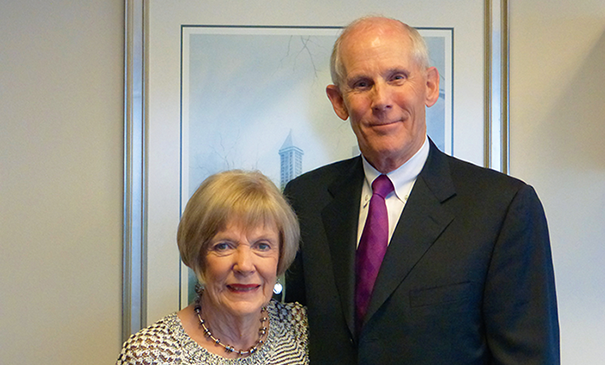 Bruce and Camille Winter first became involved with Virginia Mason as patients about 28 years ago. “We've been going to Virginia Mason ever since, and we've been very, very pleased with the support and the facilities and the doctors,” Bruce says. Many positive personal experiences inspired the couple to give their first gift in 2008. The Winters met on a soccer field, where their sons played, and subsequently discovered they both had attended Roosevelt High School and the University of Washington. The two found themselves on the same flight shortly thereafter. “I bought her a little bottle of wine on the plane, and the rest is history,” Bruce recalls. They married in 1986 and together they have five children. After graduating from the University of Washington and earning an MBA from UCLA, Bruce worked in manufacturing, spending 17 years at PACCAR, Inc., and two years at Lanoga. Bruce then transitioned to the financial field. “I wanted to get into something where I could control my own destiny,” he explains. He started at Shearson Lehman Brothers and today is portfolio management director and senior vice president at Morgan Stanley. Camille has worked as a school teacher and a product information specialist with Eddie Bauer. It is important to the couple that their philanthropy remains local, according to Camille. “We just don't give to very many national charities. We like to see our dollars at work,” she explains. They feel confident their donations have had an impact, for example, helping to build the Floyd & Delores Jones Pavilion. “I have been very happy to give because Virginia Mason is very much on the leading edge with respect to its facilities,” he comments. Bruce additionally sits on Virginia Mason's Board of Governors, which has given him greater insight into the inner workings of the hospital and medical centers. He also was instrumental in encouraging Morgan Stanley to become a corporate sponsor last year.